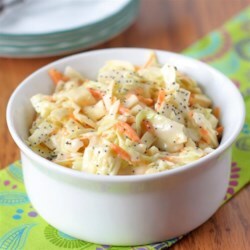 I just made this coleslaw for a big cookout that I am hosting tomorrow and I had to rate this right away! It is delicious! I haven't even chilled it for the 2 hours and it is so good! I can't wait to share it with my friends and family. I followed the recipe exact with the exception of using mayo and no poppy seeds. This is my slaw recipe for now on, thank you!